Come and enjoy the splendour that Dreamsea Surf Camp has to offer. Get closer to nature and feel part of it. It’s time to breath fresh air in an environment full of magic, surf, active and healthy lifestyle, comfort, and fun. Dreamsea Surf Camp Spain is not just about surf, it is much more, it is about a life philosophy, about enjoying every second of your life through sport, sun, beach, relax, yoga, comfort, etc. And in order to achieve this they will provide you with a great selection of equipment that will maximize your surf camp experience, completing your holidays in a way of quality. You will stay in glamping tents with high quality mattresses because there is no reason to sacrifice comfort and luxury if you want to enjoy the great experience of outdoors holidays in harmony and contact with nature. 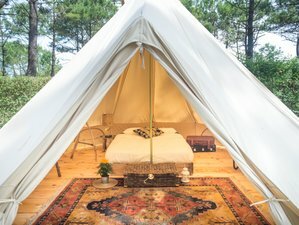 Glamping is a new and growing trend from the last decade, a fusion of glamour and camping. It is a perfect concept for those who love the positive points of camping and outdoors lifestyles but forgetting all those negatives aspects and enjoying complete comfort. Dreamsea Surf Camp Spain invites you to try this new concept of camping in their double bed glamorous tents. Furnished and decorated with a cozy and pleasant taste, out of recycled materials and equipped with a very comfortable mattress. You will receive 10 hours of lessons per week, all of them in the water and 15 hours of surf lessons if you book the intensive lessons course. With no more than 2 lessons of 90 minutes per day, this makes Dreamsea Surf Camp Spain as the best option if you are really interested in learning how to surf. All with the best qualified and experienced instructors you can imagine. All instructors in Dreamsea Surf Camp Spain will teach you not just how to surf, but how to enjoy the ride, and most importantly, how to enjoy the learning process, in a lifetime experience. They have the best equipment, which you can use even after the surfing lessons, all for free. With Dreamsea Surf Camp Spain you can be assured of safety and comfort in the water, this is down to the fact that they provide one instructor per eight students. Their instructors will be in the water helping you out, so you will be able to take advantage of the personal attendance your instructors will give you. Your instructor will also be the same all week long, meaning you will be able to forge a relationship that will help get the best out of your lessons. If you already have enough experience to surf independently and want to have the fun of a surf camp experience, you can join Dreamsea Surf Camp Spain without having lessons with free access to all the equipment, including the surf equipment. You are also welcome to bring your own stuff if you prefer. Again, the instructors will be at your disposal for any advice or recommendation about surfing. Dreamsea Surf Camp offer you the opportunity to live the real glamping experience staying in one of their exclusive fully equipped bell tent. Get lost in its comfort, and feel the positive atmosphere of this beautiful space that integrates design with nature. Don’t miss the opportunity to discover the fishing village of Cantabria, with its beautiful landscapes and beaches, and all the exciting CULTURE that exudes all around. Now is time to relax, and lie down on the warm sandy beaches, while watching the snowy peaks of Los Picos de Europa. The surf camp offers you a dreamland place where you can rest, stay healthy, try new and exciting sports, and contribute to a more sustainable way of life, all while connecting your soul to earth, because life is all about happiness. The west coast of Cantabria, where Dreamsea Surf Camp is located is famous for the great beauty of its landscapes and nature, the contrast of the green of its meadows, the white of the sandy beaches and the blue of the Cantabrian Sea, makes of its beaches an authentic visual experience. The surf camp is located in the campsite “El Helguero”, one of the most beautiful areas of Cantabria, a privileged and strategic location that will allow you to discover the magic of Cantabria, few kilometers away from Comillas, one of the nicest towns in Spain, famous for its streets and architecture, as well as for Gaudi´s “Capricho” one of the first masterpieces of the famous Spanish architect. Cantabria is well known for its premium seafood besides having sensational wines and the best Spanish hams and cheeses. This makes Cantabria the ideal place to spend your vacations. This area is a paradise where you can surf well as relax, disconnect, enjoy nature and the gastronomic culture. Massage service is available for you to relax your body and mind after an exhausting day of surfing. Fall in the hands of a professional massage therapist and get your muscles ready again for the next day adventures. This service is not included in price and available at extra cost. Please book your flight to arrive at Santander Airport (SDR). Transfer from and to this airport is available upon request. The pick-up service will cost 25 EUR per person / way. You also can take the direct shuttle from the airport to the bus station, every 30 minutes there is a new shuttle connecting the airport with the city of Santander, and from there you can take the bus which takes you to San Vicente de la Barquera. There is a bus line which takes you direct from the airport to San Vicente de la Barquera and get down at Ruiloba or Comillas. Dreamsea Surf Camp Spain will pick you up from there free of charge. You can also arrive at Bilbao Airport (BIO). Pick up service from Bilbao Airport is available for 40 EUR per person / way upon request. From all around Europe you can fly to the main Spanish cities, such as Madrid, Barcelona or Bilbao. From any of this Spanish cities, you can easily get a direct bus to Santander, Cantabria. Finally take the bus from Santander to Comillas, where Dreamsea Surf camp will pick you up. Dreamsea Surf Camp Spain recommend you to use ALSA if you are coming from Madrid, Barcelona or Bilbao. Airport: Santander Airport Airport transfer available: Santander Airport (US$28 per person) Additional charges may apply. You can request this in the next step.